Our friends over at The Loop Loft have been busy lately, and have cranked out some new loops (with Impact kits!) for Studio One. These include “Everything But Sticks,” “Indie Rock,” and “Celso Alberti.” There are several volumes to each title, which are available individually—but they are also available in collected bundles. And when you buy a bundle, you save a bundle. All of these are ready to audition and buy over at shop.presonus.com. All of these loop packs are include both .WAV and AudioLoop formats, and are sampled in high-quality 24-Bit 48 kHz audio. They’re 100% royalty-free—use them in your songs and sell them without any hassle. 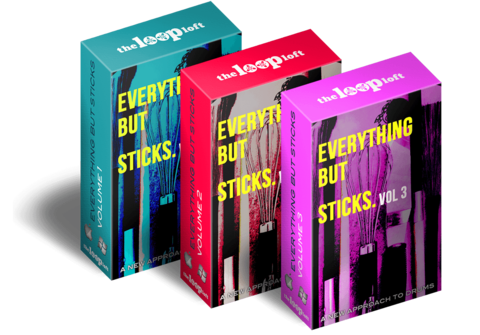 With the Everything But Sticks Bundle, you’ll get instant access to both Vol. 1, Vol. 2 and Vol. 3 of this groundbreaking collection of loops and samples, while also saving 50%. If you’re seeking organic and unique grooves that layer seamlessly in your productions, this is the bundle for you! Let’s be honest. 99% of the drum loops in existence use sticks. This isn’t necessarily a bad thing, but isn’t it time to do something different? This is why we set out to produce Everything But Sticks, a collection of loops and samples that take a new and fresh approach to grooves on the drum set. 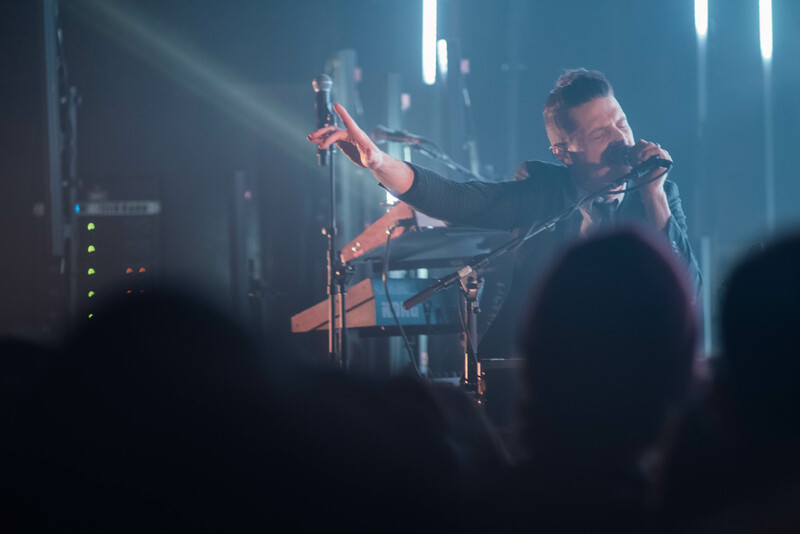 By using a wide variety of brushes, mallets, bundles, kitchen utensils and even our bare hands, we were able to pull out an entire range of timbres and dynamics from the drum kit that sticks simply can’t produce. For fans of our Cinematic and Art of Brushes collections, Everything But Sticks will be a welcome addition to your arsenal of loops and samples. And if you’re not familiar with some of our non-stick offerings, Everything But Sticks is the perfect place to start. 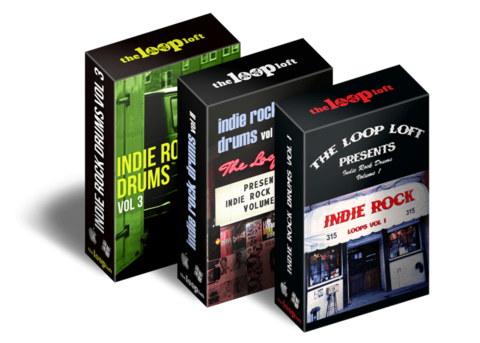 We’ve bundled all three of our popular Indie Rock Drums collections, giving you instant access to our massive library of authentic indie drums, while also saving you 30%! With drum sounds and grooves inspired by the likes of Built to Spill, Ted Leo and the Pharmacists, The Strokes, Fugazi, The Flaming Lips and a host of other bands. 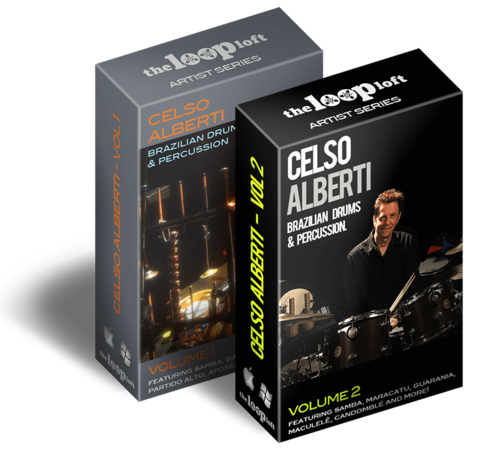 The Bundle includes both Volume 1 and 2 of the hugely popular Brazilian Drum series. Free 30 day Learning to Mix Trial for Studio One! 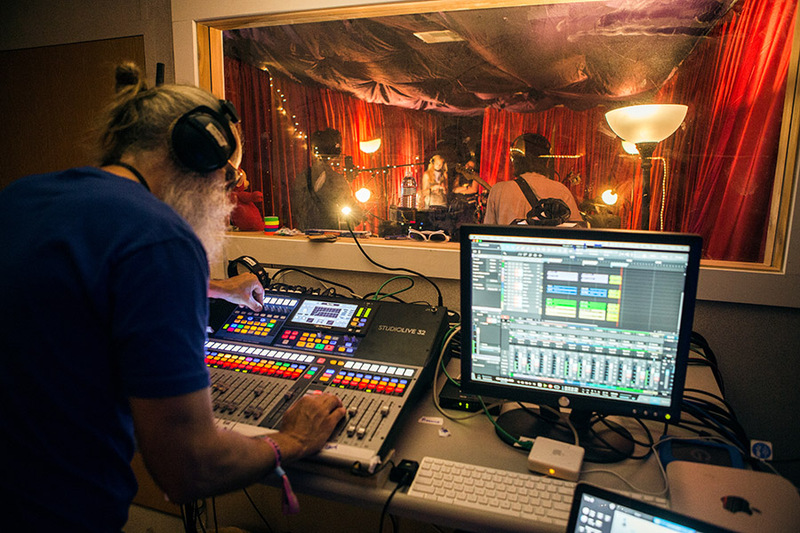 Learning To Mix is premium training for the recording musician and aspiring audio engineer, and as a user of Studio One we are delighted to be able to offer you a FREE 30 day Learning To Mix trial. All you need to do is sign up with the link below, no code needed, it’s that simple! Click here to get your FREE 30 day LTM Trial! 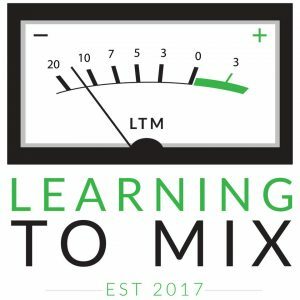 Once you sign up you will receive an email from Learning To Mix telling you how to log into your account. At the end of 30 days you will be charged the regular monthly membership price of $22.00 per month unless you cancel. If you have any questions, you can contact LTM via their website. 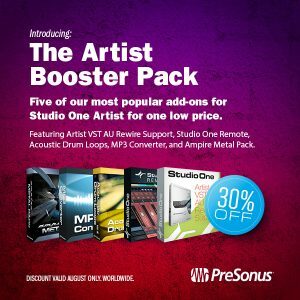 Comments Off on Studio One Artist Booster Pack for 30% Off in August 2017! If you’re looking for brush loops, then you’ve come to the right place. We’ve bundled together Vol 1, Vol 2, Vol 3, Vol 4, and Vol 5 of our popular Art of Brushes series to give you the entire collection at one low price. From jazz, to roots rock, to blues, to funk, this bundle of brush loops will supply you with the grooves and sounds you need to produce authentic, warm, and unique sounding drum tracks. Click here to get them on shop.presonus.com! If dry, punchy and fat drums are what you’re looking for, then this is the bundle for you. 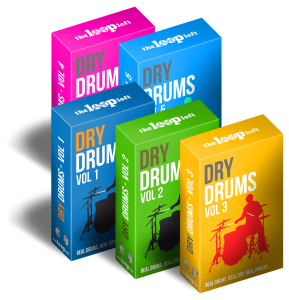 The Dry Drums Bundle gives you Vol 1, Vol 2, Vol 3, Vol 4 and Vol 5 of this popular series, all at 50% savings. Ever since Ringo Starr placed tea towels on his drums with The Beatles, the punchy, fat sound of “dry drums” has been sought after for decades. With The Dry Drums Bundle we give you this classic sound served up in twenty-four complete loop sessions and a variety of meticulously sampled drum kits. Recorded with an array of vintage mics, preamps and fully dampened heads, Dry Drums will easily sit in any mix, while providing the punch and clarity that is almost impossible to achieve with overly “live” sounding loops and samples. Each session comes complete with a multitude of beats, fills and transitions, allowing you to easily arrange your own custom drum track in seconds. It’s #PreSonusFAMFriday with Ryan Landry! 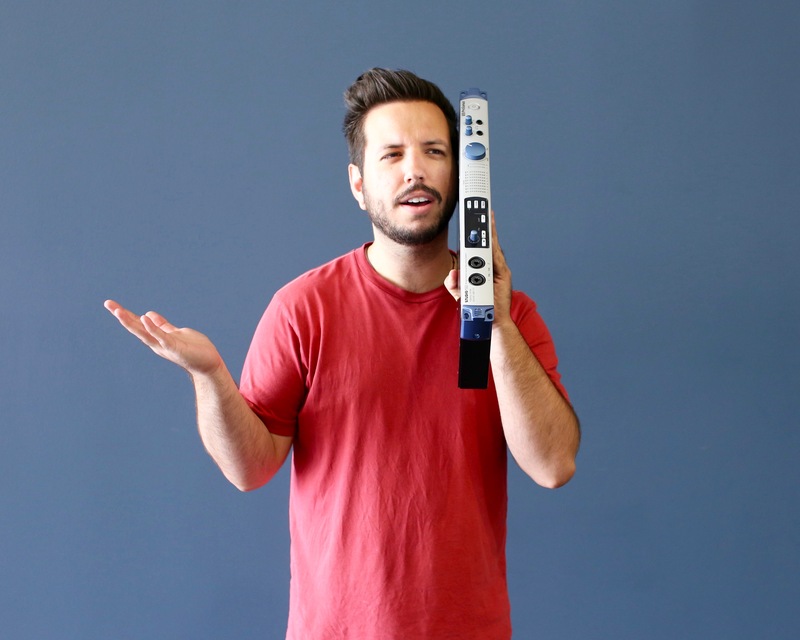 Ryan Landry is PreSonus’ Inside Sales Lead and Magisterial Overseer of Cookie Distribution. When not at the office, Ryan lives the life of a multi-talented drummer/poet; a renaissance man who lives on the razor’s edge between heartbeats and spreadsheets. Ryan’s been with us for a few years now and we’re not quite sure what we would do without cookies. Three years to the date, today! Exactly! My co-workers. I work with some truly incredible people. Unfortunately, I never saw the light of day for 8 tracks or cassettes. The first CD that I can remember buying is “Broken Boy Soldies” by The Raconteurs. This Will Destroy You. Specifically, their self-titled album. I’m a drummer (I’m sorry.) I play in a group called Spyglass and another group called The Vigil Project. What do you love about the Studio 192? The quality of sound, the remote preamps, and the mixer in UC Surface. Being a DIY bedroom drummer, it’s the perfect tool for me to get high-fidelity recordings at home. I keep my drums set up in one room and my computer is located in another room. From my iPad, I can set my preamp levels, create a monitor mix, and control Studio One 3 from the Studio One Remote App all without ever having to leave my drums. It’s the dream piece of gear for a lazy drummer like me. A pair of Eris E8’s, a pair of Eris E4.5’s, a pair of Ceres 4.5’s, a Monitor Station, an AudioBox iTwo, an HP2, an HP4, and Studio One 3. Meeting Mutemath! 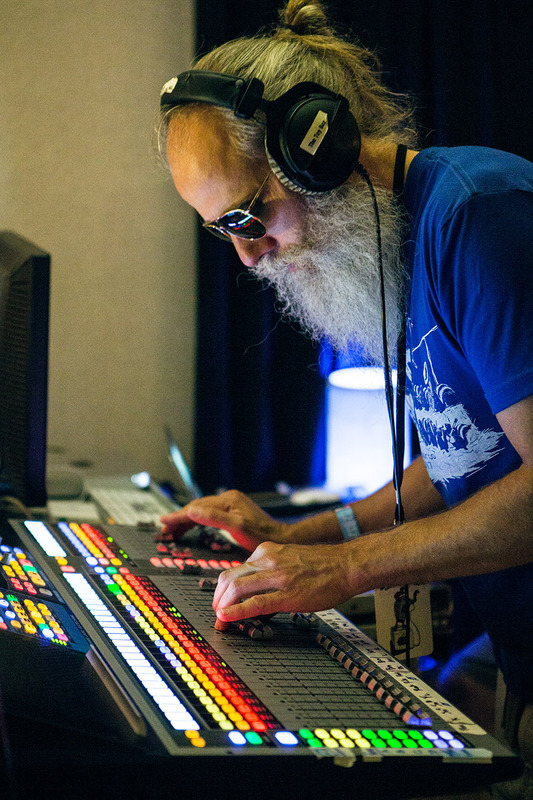 I’ve been a big fan of them for a couple of years now and I was excited to learn when they started using our mixers on their Vitals tour. They had an off day on tour and came by the office to pick up some more gear; I got a chance to meet the guys and hang out for a bit. Outside of work? My band, Spyglass, is working on finishing our debut album that’s going to be released this summer. Got any tips for working with the interface? Use it with Studio One 3 for the best experience, hands down. The Z-Mix feature will allow you to do zero-latency monitoring within Studio One 3. Keep up with Ryan on Instagram! 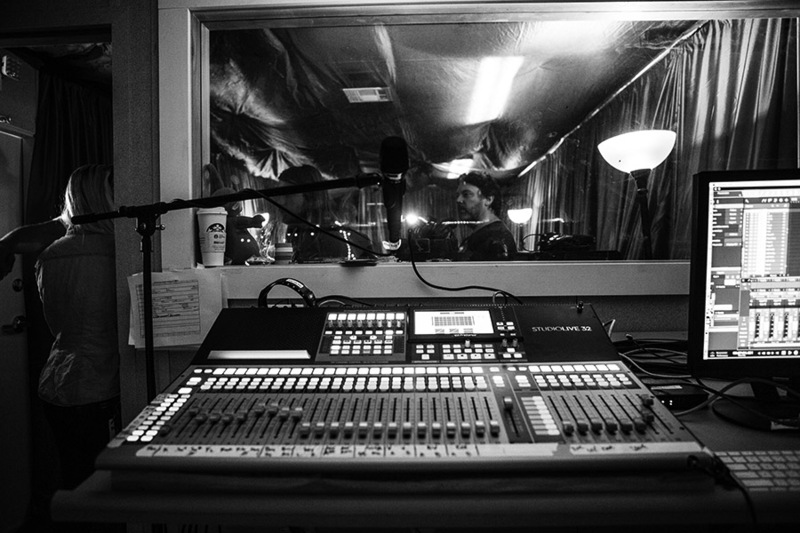 Click here to learn more about the Studio 192! Comments Off on It’s #PreSonusFAMFriday with Ryan Landry! Softube’s Tape plug-in adds cohesion and weight to your mixes. But Tape goes far beyond your average tape machine emulation. It includes three distinctly different tape machine types, and it offers the ease of use and low CPU strain that today’s music creators rightfully expect. Even in this day and age, it’s common practice for computer-based professional studios to run their mixes through at least one generation of analog tape. Why? Because even when used subtly, analog tape has a smoothing effect and adds cohesion and weight to a mix—it takes the recording from a collection of individual tracks into a song where everything is connected and works together. 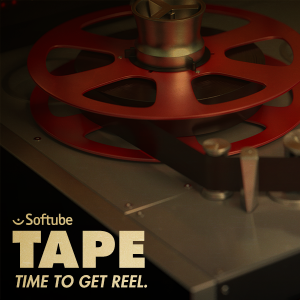 With Softube’s Tape plug-in, you can have all that and more. Tape includes three different tape machine types in one plug-in. Type A is based on a classic Swiss high-end reel-to-reel machine, known and loved for its precision and linearity. Type B is much more colorful—it’s a transformer based machine which adds extra weight and cream to the low end. Lastly, Type C is based on a British tape machine with a distinct vintage vibe. Select your favorite tape machine Type, and adjust the Amount knob to taste. In most cases, that’s all you need to do to soak your tracks in analog tape sweetness. Easier still, load up one of the included presets, made by award winning engineers such as Joe Chiccarelli (Beck, U2, Strokes) and Howard Willing (Smashing Pumpkins, Sheryl Crow, Kris Kristofferson). Feeling tweaky? Why not start by trying the different tape speed settings—you’ll find that the slower the tape speed, the more pronounced is the so-called tape head bump, which adds low end to the mix. Or open the Remote Control panel where you can control the selected tape machine’s speed stability, crosstalk amount and several other tape-a-licious features. Add a single instance of Tape on your master bus to emulate what most computer based studios do today—mix in the computer, then mix down to a stereo tape machine—or go vintage style by adding Tape to every single track in your mix. Yes, your computer will be able to handle it. As most Softube plug-ins, Tape is uniquely light on your computer’s processor. If you run PreSonus Studio One, you can not only use Tape as a standard plug-in—Adding Tape to your MixFX slot gives you Tape Multitrack. Tape Multitrack includes all the goodies of Tape, but in addition, you get selectable crosstalk between each individual track—and you can easily control the Tape Multitrack settings from a single interface. The Tape and Tape Multitrack license is one and the same. This means that if you’re not a Studio One user but at some future point decide to switch to it, you will already have Tape Multitrack installed, licensed and ready to go. Click here to get Tape from shop.presonus.com! How is doing music for games different than doing music for film or TV? What features in Studio One make it particularly well-suited for this application? Doing music for games is technically a completely different process than composing for film or TV, because the music in video games is non-linear and interactive, unlike on films and TV. When you compose a cue for film or TV series, you are limited to the timeline of that particular scene, and you have to sync everything to fit in that particular timeline. 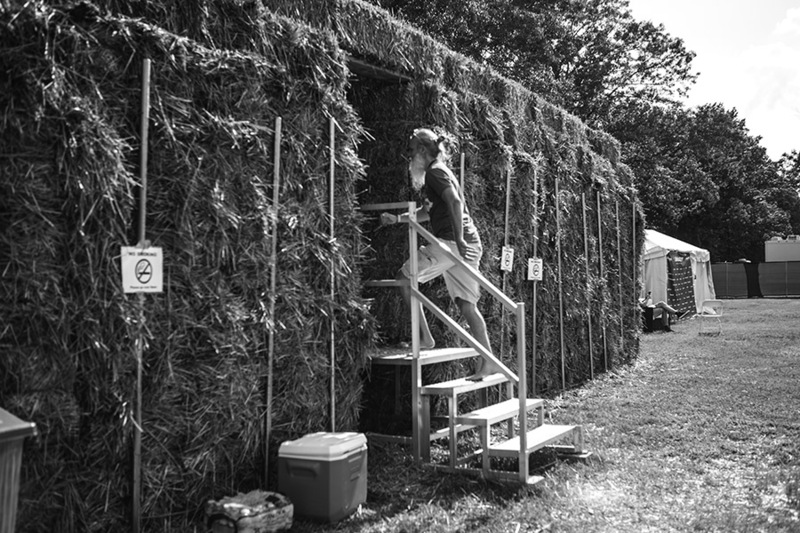 In the game, the music needs to follow the decisions of the player and fit itself to the various situations the players will get into. That is why I compose a cue for a game in segments. In other words, I create a piece of music that can be divided into looped 8-16 bars parts that can be interchanged inside the audio middleware and each cue has a short ending stinger that can be triggered at any point to end the music cue. This idea is best applied to big action sequences and boss fights. When it comes to ambient atmospheric music, it’s fairly similar, but sometimes it’s not needed to be looped, and you can just transition from one ambient track to another, because I usually compose them in the same key, or I at least make them start and end on the same note for easier transition. That’s the approach I used for Starpoint Gemini Warlords for example. You’ve been using Studio One for a long time. What are some of the more recent features that you found yourself using during the scoring of Starpoint Gemini Warlords? Scratch Pads are hands down THE BEST idea ever! I love having the option of being free to experiment and change the arrangement of a cue in a single project that’s opened. It is very useful when I want to create different versions of one track to test how it sounds in different variations. I also love the fact that no matter how many scratch pads you have opened, everything is mixed in the same mix window, so I can bounce different versions very easily and quickly send them off to the developer for listening. I have to say that Studio One Mixer is absolutely the finest and probably the most respected mixing engine out there today. I have a lot of DAWs that I use for composing when collaborating with other people on projects, but I ALWAYS mix my tracks in Studio One. Project page is also awesome, especially when I need to deliver a big amount of mastered tracks to a client and I need to make sure they all sound the same and have the same levels. It’s just amazing, and the fact that I can quickly take care of meta-tags and add album art cover is really cool. The official soundtrack for Starpoint Gemini Warlords is being prepared in Project page, and it makes my life a whole lot easier. I also love the fact that it has all the needed metering in a single window, so I don’t have to load other plugins and use up my CPU. Bouncing in place and converting tracks in project pool is also a feature I use a lot. Creating FX chains with various plugins has made my mixing and sound designing process lightspeed faster, because I can always recall a preset I have created and use it over and over again no matter what plugins I have in the chain. Mojito is still my favorite go-to synth for bass lines. I generally love the sleek and clean look of Studio One interface and its plugins, because it makes my job a lost faster and easier to do without the need to think about “ooh what does this button do?” or spend a lot of time in sub-menus to find the option I need. Do you use the Notion integration? Yes I do. Not always, but I most of the time when I am working on piano and orchestral pieces, I always check my score sheet with Notion. What I’d love to see in the future is having Notion editor as an actual part of Studio One Pro. For example, when you open up a midi editor, you can also switch to Notion editor in the same window and tweak the notes on the staff. Does your score consist of recordings of live instruments or are you using virtual instruments exclusively? If so, which ones? 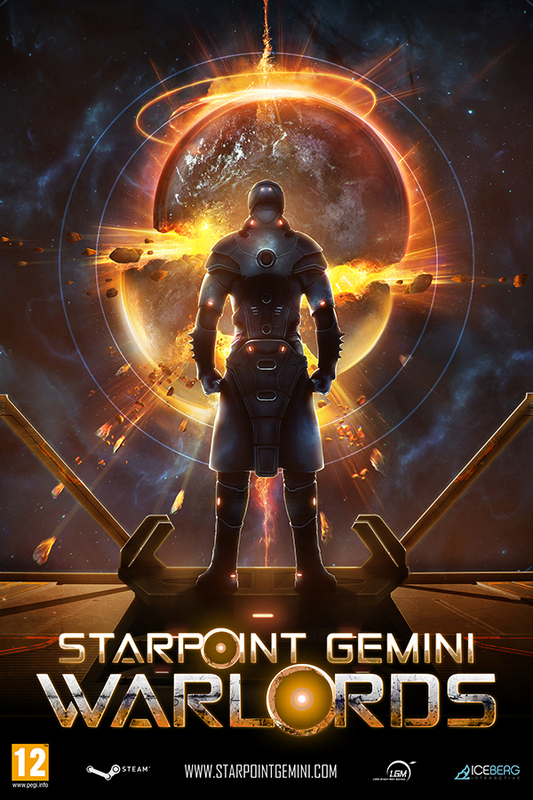 The score for Starpoint Gemini Warlords consists of both virtual and live instruments. All of the guitar and bass parts are recorded via my FireStudio Project interface, and I also recorded my external hardware synths through FireStudio. This is mostly synth-oriented soundtrack that pays the homage to some of our favorite games and sci-fi franchises. My main synths here were my hardware synths Yamaha DX7 and KORG Volca Bass and Volca Keys, and all of them were processed through my guitar pedals, but regarding the software synths, I used Arturia V collection (mostly MiniMoog V, CS-80 V, ARP 2600 V, and Modular V) and U-He Zebra 2. I also used Mojito for basses and Mai Tai for some pad and drone sounds that were later processed via different FX plugins. As Starpoint Gemini Warlords is clearly a Space Opera of sorts, do you take any inspiration from John Williams’ use of leitmotif in Star Wars? Any other musical influences you’d care to talk about? What I love about Little Green Men studio (the developers of the game) is that it’s a group of fanboys and fangirls and it was a lot of fun at brainstorming meetings regarding the soundtrack for the game. Everybody was into sci-fi music and everyone has their own favorite franchises, so I had to do a lot of research and take a listen of various sci-fi game and film soundtracks. There were no traditional leitmotifs for characters, instead we decided to represent each sector in the game with a different melodic theme based on what usually goes down there, so for example more friendly sectors have some light evocative music, alien sectors are more mysterious and feature elven type of vocals and exotic woodwind instruments, while pirate and outlaw sectors are very dark and aggressive in sounds. 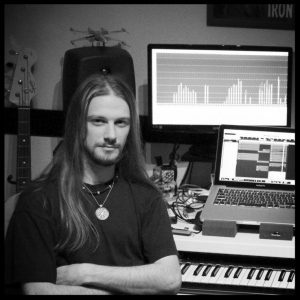 The biggest inspiration came from video game soundtracks such as Homeworld, EvE Online (I’d love to score that one in the future), Mass Effect, Deus Ex The Human Revolution, and Battlestar Galactica TV series. Any advice to share for musicians and producers who want to get into game audio or music but don’t know where to start? First thing I suggest you do is to join audio societies such as AES (Audio Engineering Society), G.A.N.G. (Game Audio Network Guild), and visit conferences such as GDC (Game Developers Conference) and GamesoundCon. You will meet a lot of people from the industry, and they will all be more than happy to share knowledge and forward you to other people as well. Read books on game audio from publishers like Focal Press for example, I know that helped me a lot. You can always look for some smaller mobile gaming developers out there in your local communities and get in touch with them as well. And the most important thing of all is to learn your craft and learn it good. Don’t get overwhelmed by this or that plugin that’s newest on the market or whatever. Get a set of tools that you like and learn them well inside and out. You will be amazed by how easily you can get great results with bundled plugins that come with your DAW. I still use my Studio One Pro EQ and Compressor most of the time for sampled stuff. Create your own sounds from the stuff that you have. A developer will always learn to appreciate more the fact that you took your sweet time to create something original that’s only for them, than sending them something created with commercial instruments libraries that everyone uses. Studio One 3.5 is here! This is a free update for owners of Studio One 3.x. Click “Check for updates” in Studio One’s start page to get it! Full release notes follow. For a less-technical overview, check out the video below or visit our What’s New page here. Save / Auto-Save. Files created in 3.5 will no longer open in previous versions of Studio One. you like to continue working with a previous version as well. • Fade handles are hard to reach when event volume is not at max.